Several Home Warranty Plans are available that provide insurance for the major systems and basic appliances of the home. The cost is approximately $350 to $500 per year depending on the extent of coverage. These plans can easily pay for themselves should a covered item need repair or replacement. The sale of real property involves transferring large sums of money and signing important documents by you, the Seller and your lender. Escrow is the process in which an impartial third party acts as a stakeholder and facilitator for both you and the Seller. Typically this entity is the Title Company. It carries out both parties’ instructions and handles the paperwork, distribution of funds, title insurance, and the transfer and recordation of the title deed. Escrow is normally opened within one business day of acceptance of the purchase agreement and at this time your initial deposit as specified in the contract is deposited into the escrow account. The duration of the escrow period—from offer acceptance to recordation of the transfer of ownership—is usually 21 to 45 days. Property Inspections. Professional inspections probably constitute the most important part of your due diligence on the property, and are typically conducted within 15 days of offer acceptance. Please review the “Buyer’s Inspection Advisory” carefully. Inspection fees are usually paid by you, but the costs of issues that surface in the course of inspections are normally negotiable between you and the Seller (as specified in the purchase contract). It is vital you attend all inspections so you can see for yourself any problems that surface, ask pertinent questions of the inspector, and gain first-hand knowledge about property conditions and maintenance. Contractor Inspection. This inspection covers major systems such as plumbing, heating and electrical; structural elements; roof; safety features and building code compliance. Other Inspections. Inspections by other professionals may be warranted based upon the specific property and disclosures provided by the Seller. These include inspections by structural engineers, surveyors, and experts in soils, roofs, fireplaces, underground storage tanks and environmental hazards. Review Disclosures. Sellers of residential properties and the real estate agents involved are required by law to disclose any material information known regarding the condition and circumstances of the property, and a number of statutorily required reports and disclosures will be supplied for your careful review. Sellers of probates and foreclosures are exempted from a number of these requirements. Finalize Financing. Ideally, you’ve already been pre-approved by the lender of your choice prior to making your offer to buy, During the escrow process, the lender will have the property appraised, and review the purchase contract , title report and other documents it deems necessary prior to giving final loan commitment. This process usually takes two to four weeks. Before funding, it will typically confirm that your financial situation has not changed. Home Warranty. Home warranties are designed to protect you against unknown defects and failures in certain systems and appliances in your new home. We will provide information and referrals, outlining procedures, costs and coverage. Either Buyer or Seller may purchase a home warranty. Remove Contingencies. Once you have completed your inspections and reviewed the reports and disclosures to your satisfaction, and received final loan approval, you will remove your contingencies of sale as specified in the purchase contract. Depending on how the contract was written, you may be increasing your deposit in escrow at this time. Review & Sign Loan & Closing Documents. We will accompany you to the title company to sign documents. Confirm you have satisfied all your lender’s requirements. Review the loan documents carefully. Review the estimated closing statement of costs and disbursements prepared by the escrow agent. Receive your closing documents from the title company. After both buyer and seller have completed their contractual obligations, and closing documents have been signed, your lender will wire the loan funds into the escrow account. Your title company will then record the title deed and loan deed of trust at the Recorder’s Office. You are now the proud owner of your new home and the keys will be personally delivered to you. Occasionally, Sellers may request the right to rent back the property after the close of escrow for a short period of time. If you agree to a Seller rent-back, the terms are negotiated as part of the purchase contract. It is typical for the Seller to pay prorated rent equal to the principal and interest costs of your loan plus property taxes and insurance (PITI). Copies of all documents pertaining to the home purchase: contract, addenda, reports, disclosures and any other documents received during the process. 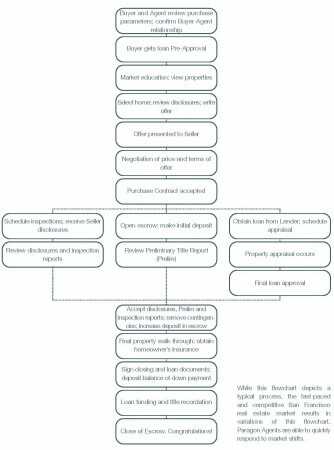 While this flowchart depicts a typical process, the fast-paced and competitive San Francisco real estate market results in variations of this flowchart. Agents are able to quickly respond to market shifts. Not having your agent do a full comparative market analysis of the property: a clear-headed assessment of what fair market value is. Not making a list of the strengths and weaknesses of the property, to keep in mind during the negotiations or perhaps to even use in the negotiations. The flip side of #1 & #2: Getting too excited and making a purely emotional decision. When buyers see that other buyers want the property, the “value” of the property soars in their mind, which is why the highest prices always result from either multiple bidding or the fear that others will be making offers. A good listing agent does everything he or she can do to manipulate this fear. This is the flip side of why values decline after longer days on market: If someone else wants it, it’s very valuable; if no one else wants it, there must be something wrong with it and it can’t be so valuable. Not setting your walk-away price before getting starting with the negotiating. At some price point, the deal is no longer worth doing, no matter how great the property. In one’s urgency to make the deal, not including sufficient contingencies to perform thorough due diligence. I’ve seen homes that look perfect turn out to have $250,000 in pest damage; if one wrote the offer without the appropriate inspection and investigation contingencies, one might win the deal, but wake up to a house with very unpleasant surprises waiting. Having an agent that is more interested in making the deal (and collecting their commission) than making you the best deal; having an agent who doesn’t know the market values in the area; having an agent who doesn’t know how to negotiate (sadly common). Not making sure that there really are competitive offers, because sometimes the listing agent will blow smoke about “expecting multiple offers.” You can even have your agent write two (or more) offers at different price points, with clear instructions as to which one to submit depending on the final number of offers received by the listing agent. Throwing in the towel when told that the seller is only countering another offer(s). If you want the property and you’re willing to pay more, one can always throw in another offer during the seller’s counter offer process with others.